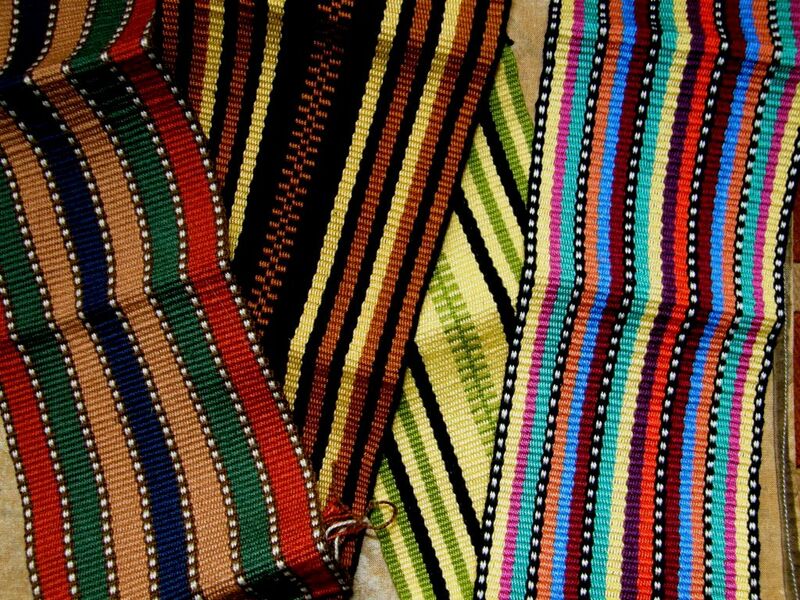 What exactly is a backstrap weaving? I talked about this a bit in a previous post and looked at some of the different kinds of fabrics that can be produced. It doesn’t have to be all about pick-up patterns and it doesn’t have to be warp-faced. For some people it may bring forth visions of narrow Scandinavian warp-faced bands decorated with pick-up patterns. Others may think of the fine ikat fabrics of Indonesia or the brightly colored supplementary weft patterned pieces of Guatemala, rich Asian silk inlay or the heavy woollen ponchos of Ecuador. It is any kind if fabric that is produced on a body-tensioned loom and I have only just scratched the very surface in my exploration into what can be woven on these simple looms. I just gasp every time I see this!! This picture is from Teyacapan’s fabulous Flickr page. 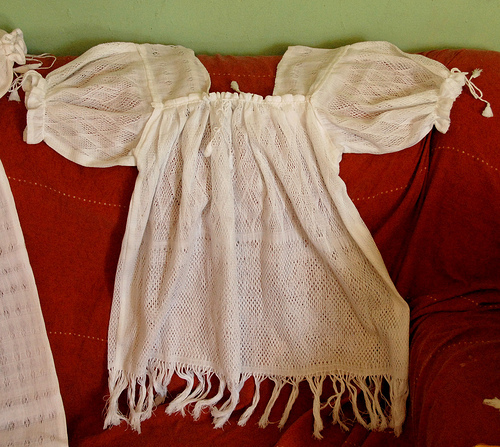 The weave is known as tejido patakua and the blouse was made in Aranza Michoacan, Mexico. In our backstrap weave-along on Ravelry we have been leaving behind the pick-up patterns for a while to play with plain weave in warp-faced and balanced weaves. It has been amusing for me to spend more time on warping and making continuous string heddles for a piece than actually weaving it. That never happens when I am doing pick-up! Plain weave is so very fast. I decided to play with stripes…no rules…go mad, stash bust. It has been a fun way to get rid of all those annoying teeny tiny balls of colors that are always sitting in a tangle at the bottom of the basket that I have never been able to bring myself to throw away. Warp up stripes, stripes and more stripes. I decided to do as one of my Guatemalan weaving teachers, Carmel, would do. She would sit at her loom and just plunge her hand into her basket of yarns and use whatever color she grabbed first for her supplementary weft patterns…a wild combination of colors! I only did this on one piece. That is about as wild as I was going to get for this weave-along and then I put a bit of planning into the other pieces. Who knew that combining stripes would be that hard? My Guatemalan multi-colored juggling balls were used to influence the color choices of the first two and then I chose some woody tones for the next. 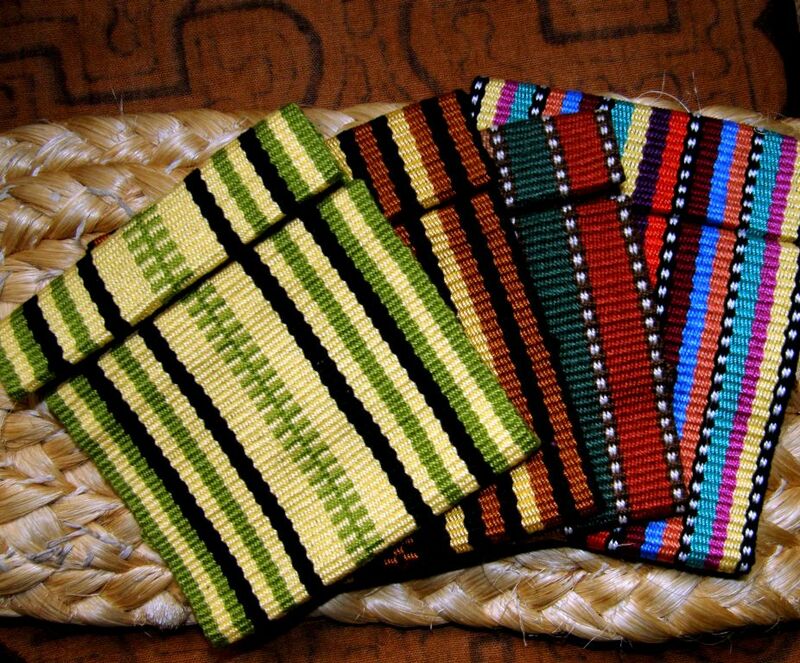 The yellow and green one was supposed to represent my home of Santa Cruz…yellow and green for pineapples and jungle and somehow black got into it too. The multiple stripes were tedious to warp but these pieces were fun to make. It was novel to be able to zoom along in plain weave. I plan to fold them as shown below and make four small purses with the zips on the front. They will be big enough for credit and business cards. Thanks to Sharon and Betty I have two large bags of colored zips to choose from. Now to get down to the sewing. There is still a lot of planning and warping and weaving going on in the weave-along so I may have time to do a balanced weave project as well using one of my rigid heddles or my bamboo reed. Figuring stripes in balanced weave is even more mind boggling for me! For warp-faced stripes I found a couple of sites. 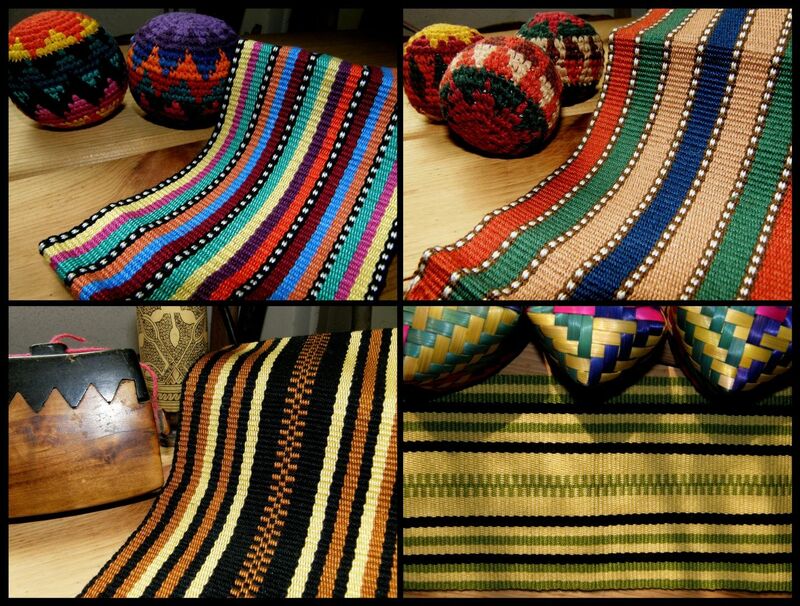 On the Handweaving.net site there is a book by Ralph E. Griswold entitled Warp-Faced Stripes. Sounds perfect, right? I have to admit that I didn’t find it, at first glance, all that helpful and got a bit fed up after five pages. Apparently there are 687 drafts in the collection and one of these days I must sit down and go through it thoroughly. I am sure it is an invaluable resource. 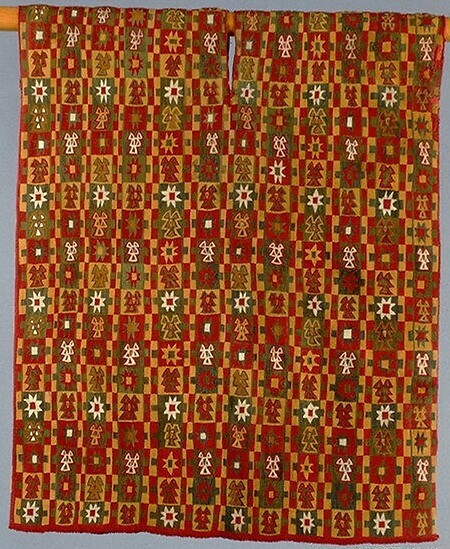 Another page which I found more immediately inspiring was a set of textiles with woven stripes and bands in the collection of the Knoxville Museum of Arts on Flickr. 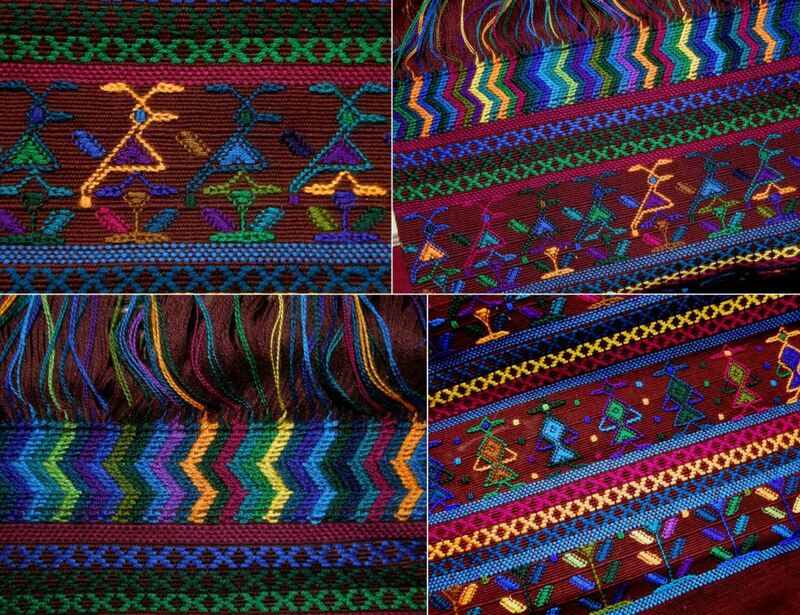 As for bold colors and bands of striking motifs take a look at the site of the Metropolitan Museum of Art which shows its current exhibit of Andean Tunics 400BCE-1800BCE (thank you Sally for the link). How nice that they allow those of us who can’t get to the exhibit to see these images. The exhibit will close in mid October before I get to the US (darn). Now I find that it was open when I was in the US last May (double darn). After all the color, I am wallowing in safe black-and-white yet again as I sample for my finnweave bag project. This will be my first large-ish finnweave piece and, as I haven’t woven this structure for a while, I figured that I should do some width samples and try out some of the motifs that I might be using. 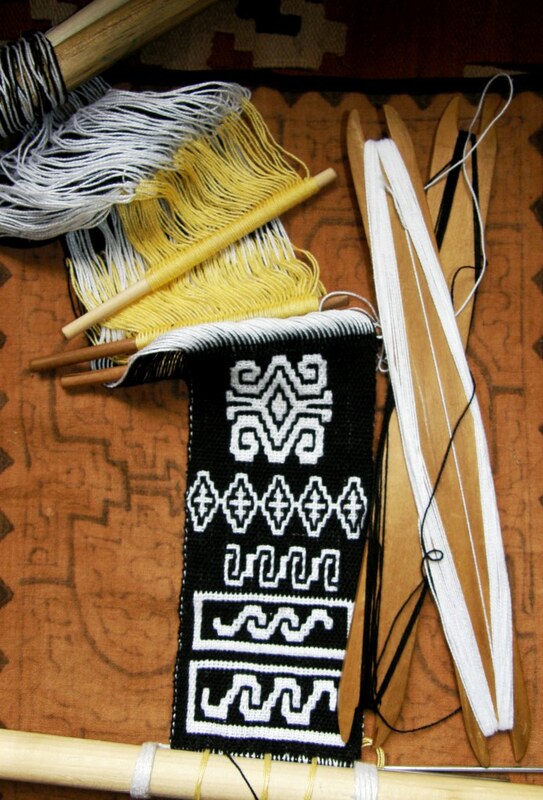 I have been practicing some of the more common border motifs that I have seen on Huichol and Otomi bags and belts. The diamond motif on my sampler is a Scandinavian one which I just thought I would throw in there. I have a couple more border patterns to try and then I will plan the large project which will be one of the hanging storage bags that I talked about last week. One lesson learned about that: storage bags must be hung high as my cat is already getting her claws into my Bedouin one. My Bhutanese motif storage bag project is on hold until I can get more black thread but I did finish the hanging strap as well as the guitar strap that was so fast to weave with its four sets of string heddles and saver cord. Now I am working on perfecting the beautiful finish that Andreas used on his woven bookmark. See how he has shaped the end? It is straightforward enough as he explained. 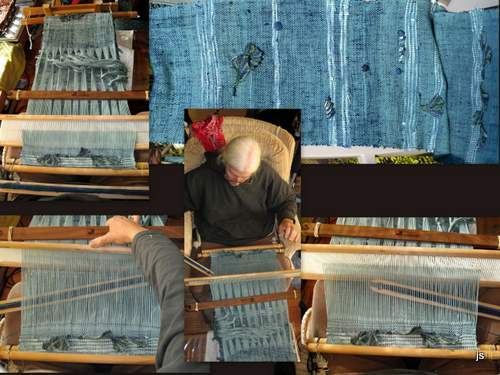 Just eliminate warp ends gradually to reduce the width of the band and then twine the warps ends down the sides. That I can do but it is getting all the twined ends neatly interlocked at the tip which has been defeating me. Perhaps I should take my own advice and try this first with thick yarn and not #10! She started off with the raw wool which she dyed and combed to produce that gorgeous fluffy top, spun the yarn and wove her three projects. The blue one will be a bag and she is currently weaving its strap. She has been looking around Ingrid Crickmore’s wonderful blog on loop braiding and has been braiding her warp ends using different techniques. 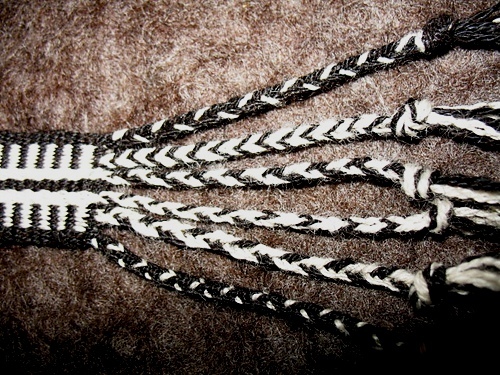 This gives me the perfect opportunity to tell you about the online loop braiding workshop that Ingrid is offering in the Yahoo braids-and-bands group this month. All you need to do is join the group to have access to the files and Ingrid will be around to answer questions. I met Ingrid at CNCH in 2010. She was teaching braiding at the Education Booth where I was playing with my backstrap loom and I could see that she was a wonderful highly energetic teacher. She has also woven with me on a couple of occasions. Anna has warped some beautiful natural handspun alpaca that she bought in Chile. Even though Karri finished her plain-weave striped backstrap- her second backstrap woven project ever- just before she joined the weave-along, I am counting it in. 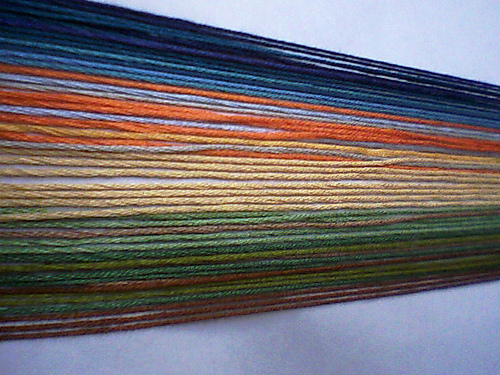 Here’s her latest warp which she says is inspired by “gorgeous southern sunsets”. Cindy is weaving her first ever band with stripes and a little help from a friend and Dyggvi has a nice striped band going too. 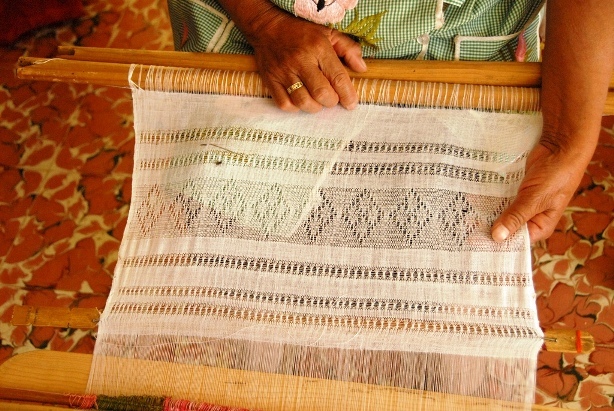 Kareanni is a volunteer with Education and More and often manages to have a weaving lesson on her visits to Guatemala. 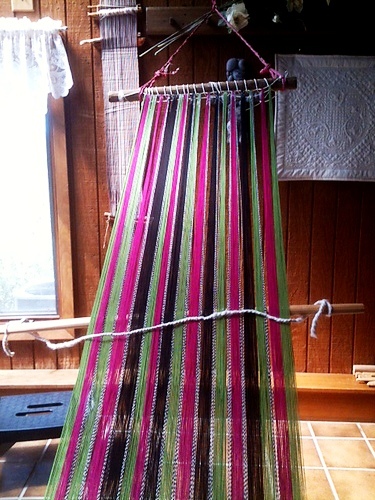 She has incorporated strips of warp thread, prepared in the ikat technique that she bought in Guatemala, into her pink, black and green warp. Blomster’s wall hanging, which she based on a textile she bought in Oman, is off the loom. That one she made on her rigid heddle loom and the little piece to the right, which was made using a rigid heddle on her backstrap loom, is also done. Kathi, whose project you can see above right, reports that her homemade rigid heddle works perfectly. There is actually a fair bit of woven fabric rolled up on the front loom bar which we can’t see. Her alpaca handspun weft had beads added to it while it was being spun, a technique she learned during the Tour de Fleece. Here are the two participants so far who are weaving balanced weave pieces without the aid of any kind of reed. Marsha made a prototype for a back scrubber in worsted weight cotton. She incorporated the braid at the start of the weaving and will try to do a four-selvedge piece next time so both ends will be the same. Phil is weaving his painted handspun warp. He feels it may have looked better warp-faced but I think that the exposure of the weft gives the image the lovely softness of a water color painting. And then jentide blew us all away with her stripes! Outside the weave-along Yonat continues to make me smile with the bands she is turning out on her inkle loom. Her bands are patterned with, from top to bottom, Andean pebble weave, simple warp floats and supplementary weft. Her Judaic bookmarks on the right, patterned with simple warp floats and supplementary weft are her contribution to a winter art sale at her temple. Anna, who bicycled her way through the Americas and stopped off to visit me for some weaving time, sent me a picture of the pebble weave and comb design belt that she has made since getting back to Australia. Before I leave you for this week I would like to tell you that registration opens on September 15 for Braids 2012 – 2nd International Conference on Braiding which will be held in Manchester, UK August 19-25, 2012. I am very excited that I will be attending and that Ingrid Crickmore will also be there giving an introduction to making “double braids” along with many other international tutors/authors teaching a variety of braid and band related topics….Jacqui Carey, Rodrick Owen, Carol James, Robyn Spady…I am not even going to attempt to name them all! I would love to meet up with blog followers and backstrap weavers in the UK so do drop me a line if you think this will be possible. 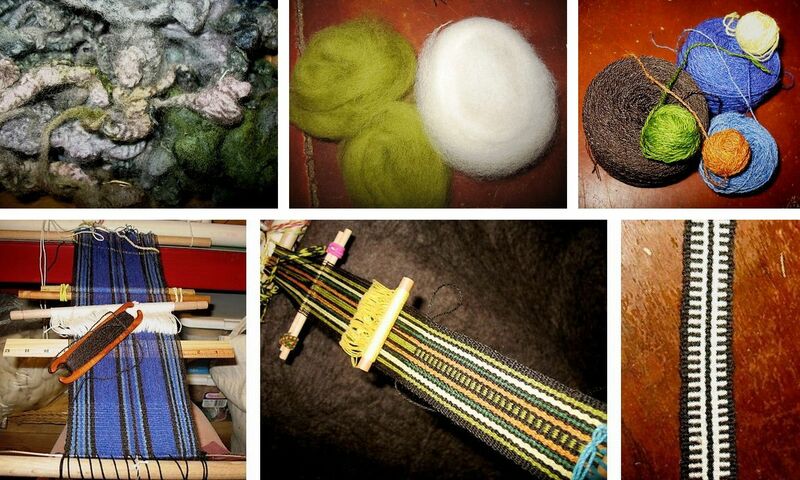 « Backstrap Weaving – Ready, Set…Weave Along! Me encanta visitarte, amo tejer en telar, ahora hace mucho que no hago nada, pero siempre lo llevo en mi corazón, y al ver tus trabajos me dan ganas jajaj.